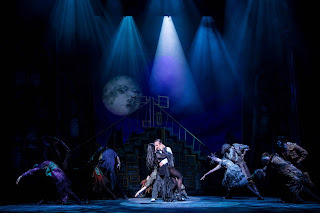 After the overture, the musical credentials are set high early with the lively When You're An Addams performed brilliantly by the whole company, and it is a benchmark for a glorious collection and, as expected from the best musicals, a contrasting collection of all styles. There is the lovely gentle What If?, the epic One Normal Night and perhaps my own favourite, the lively showtime Full Disclosure. 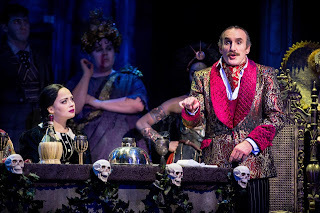 The cast is really brilliant throughout with in particular a quite amazing Cameron Blakely as Gomez, he like the rest of the cast has a superb singing voice, however, he imbues so much wicked character into the role as well. 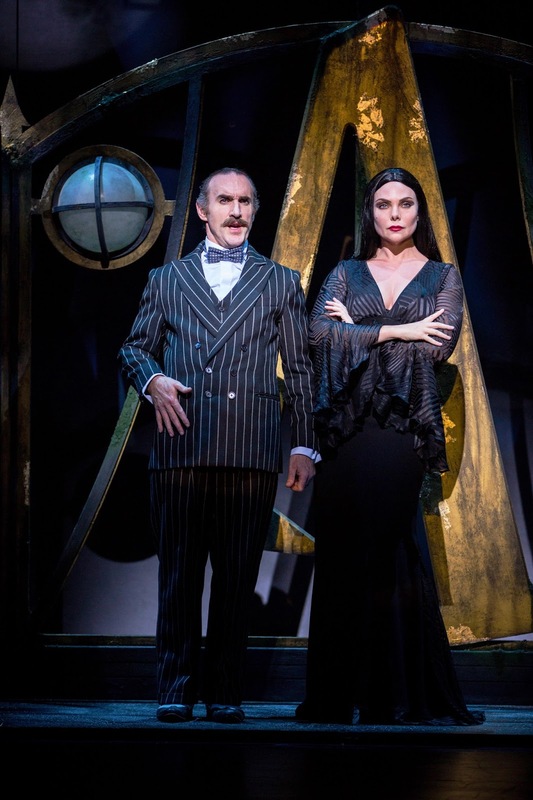 The known names of this show do not let the side down either, Samantha Womack is a deeply and darkly alluring Morticia, creating a huge amount of comedy from the deadpan character and her grimacing smiles. She shares also a stylish tango routine with Blakely, showing some neatly hidden moves. 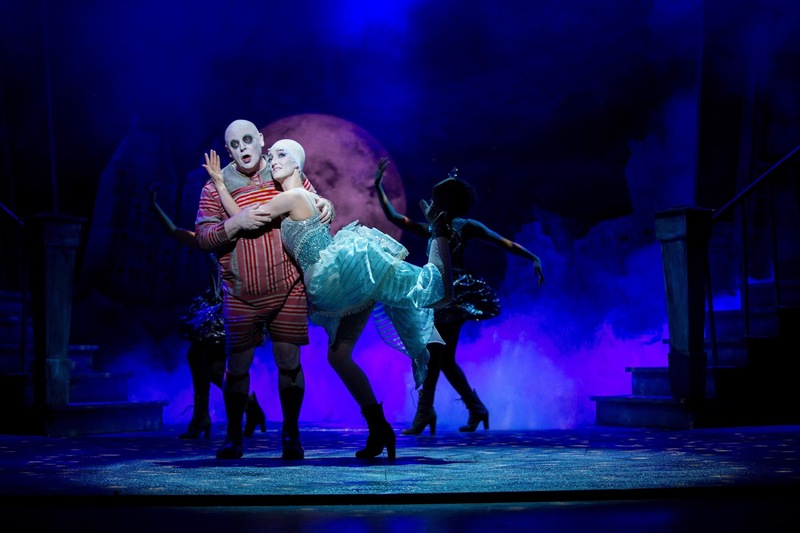 Les Dennis is also a treat as Fester, part narrator and part comic Uncle, he as expected nails the comedy, however, he also is surprising and unexpectedly good in the singing routines. His performance of The Moon And Me is really truly a sweet moment. Carrie Hope Fletcher is always a star and her cheeky and super confident Wednesday is a true delight. Full of real mischief and character, and of course a totally stunning singing voice. Dickon Gough steals every scene he appears in as the silent growling Lurch, and has a neat trick for the audience up his sleeve at the end. The ensemble from this production is also tremendously strong creating Alistair David's brilliant choreography with tremendous style and skill. 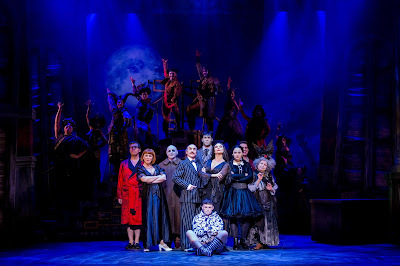 Marshall Brickman and Rick Elice's book, coupled with Andrew Lippa music and lyrics absolutely nail the dark and mischievous character of the show, treading a fine and clever balance between fun for the younger members and slipping some occasional very adult jokes into the piece without stepping too far. Therefore totally leaving this a show absolutely for the whole family. The Addams Family is a quite brilliant production, full of visual flair, stunning tunes brilliantly performed by the cast and a lovely reminder of the classic show/film, but also accessible enough for anyone unfamiliar with the original. Get yourself to this promptly as it's too good to be missed and you never know whether you have much time as we all know Death is Just Around the Corner. Performance reviewed: Wednesday 10th May 2017 (matinee) at the Royal & Derngate (Derngate), Northampton.